This is the moment we ve been waiting for, explains award-winning media theorist Douglas Rushkoff, but we don t seem to have any time in which to live it. Instead we remain poised and frozen, overwhelmed by an always-on, live-streamed reality that our human bodies and minds can never truly inhabit. And our failure to do so has had wide-ranging effects on every aspect of our lives. People spent the twentieth century obsessed with the future. We created technologies that would help connect us faster, gather news, map the planet, compile knowledge, and connect with anyone, at anytime. We strove for an instantaneous network where time and space could be compressed. Well, the future's arrived. We live in a continuous now enabled by Twitter, email, and a so-called real-time technological shift. Yet this now is an elusive goal that we can never quite reach. And the dissonance between our digital selves and our analog bodies has thrown us into a new state of anxiety: present shock. Rushkoff weaves together seemingly disparate events and trends into a rich, nuanced portrait of how life in the eternal present has affected our biology, behavior, politics, and culture. He explains how the rise of zombie apocalypse fiction signals our intense desire for an ending; how the Tea Party and Occupy Wall Street form two sides of the same post-narrative coin; how corporate investing in the future has been replaced by futile efforts to game the stock market in real time; why social networks make people anxious and email can feel like an assault. He examines how the tragedy of 9/11 disconnected an entire generation from a sense of history, and delves into why conspiracy theories actually comfort us. 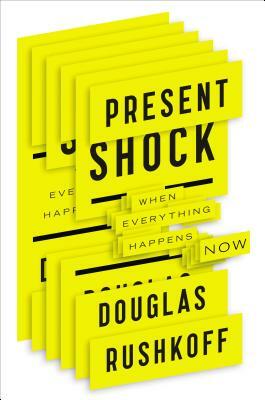 Absorbing and thought-provoking, "Present Shock "is a wide-ranging, deeply thought meditation on what it means to be human in real time. DOUGLAS RUSHKOFF, PH.D., is a world-renowned media theorist whose twelve books, including "Life Inc "and "Program or Be Programmed," have won prestigious awards and have been translated into thirty languages. He is a commentator on CNN and a contributor to the "Guardian," "Discover," and NPR. He also made the PBS documentaries "The Merchants of Cool," "The Persuaders," and "Digital Nation." He advocates for digital literacy at Codecademy.com, and teaches at NYU and The New School. He lives in New York with his wife, Barbara, and daughter, Mamie.